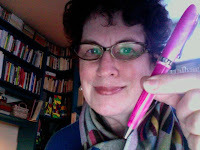 Here's an example of a perfect gift (for me, anyway): the Conklin pearlized-pink pen Le Duc gave me on Christmas. Had I hinted for a flashy yet seriously practical pen? No. I got along fine with Bics and scrounged hotel freebies. But now that I've had it for all of a week, I must carry it with me and use all the time, must know where pink pen is, must graciously accept compliments. Isn't it wonderful to give a gift that delights, and as an extra refinement, is something the recipient didn't know she would enjoy so much? If you look round my neck you can also see an Italian cashmere scarf, which is another luscious gift from him. Perfect. If your partner rolls his eyes, you can tell him this took twenty-some years of practice... but in fact he was pretty great from day one. The Mac app "Photo Booth" let me take this shot sitting at my computer and post instantly. Really fun and score one more point for Apple, whose PCs I've used since their first models. I love that kind of unrequested but very satisfying gift. How perfect! Your family are gift-givers supreme. And such fabulous photos of you! And he cooks wonderfully as well! And insists on regular visits to Paris -- it's all good, Duchesse, all good. That scarf looks sumptuous, the pen is obviously one of those items that brings luxury into everyday life, and I love the photo for showing us you in this environment (your office at home?). What a perfect gift! More though than that how lovely that he who giveth the gift took the time to know exactly what would make you happy. Happy New Year Duchesse....Beautiful as ever. Great pen! And thanks for sharing your smiling face! Thanks for sharing your new pink pen! I got a cashmere scarf for Christmas too, and it is soo soft and I love it. Sometimes the smallest things are the best! Great pink pen, it seems like just the kind of unexpected thing that brightens each day. What a treasure Le Duc seems to be (echoing Mater here). 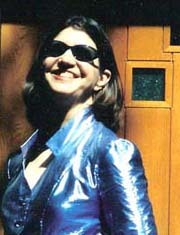 And a great smiling photo to start the new year. be happy in the pleasure of your pink pen possession! I love having a "good pen." I have a red Mont Blanc Generations fountain pen (red is my color, bien sur), and people do notice when I use it. More importantly, though, I enjoy using it. It's like taking out an embroidered handkerchief rather than whipping out a Kleenex. P.S. I love the scarf, as well.